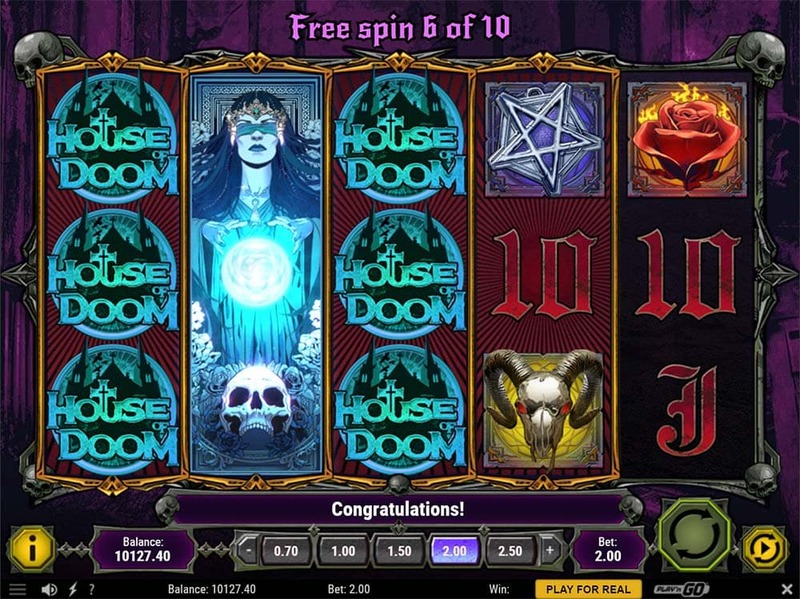 SlotsMagic Casino has recently added the new House of Doom slot from Play’n GO which is a Heavy Metal/Occult dark themed 10 payline machine. 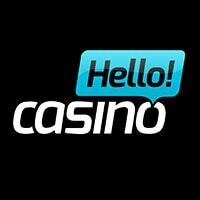 This release seems to be aimed at players who prefer a more mature looking slot and one that also offers some “Big Win” potential with up to 2500x stake wins possible and comes with a variety of interesting features which include expanding wilds, bonus picking round and of course free spins. During base gameplay, you’ll notice a Hellgate feature activating on each spin where a reel becomes highlighted in gold around the edges, if the wild symbol then lands on this reel it expands to cover the entire reel with wild symbols. 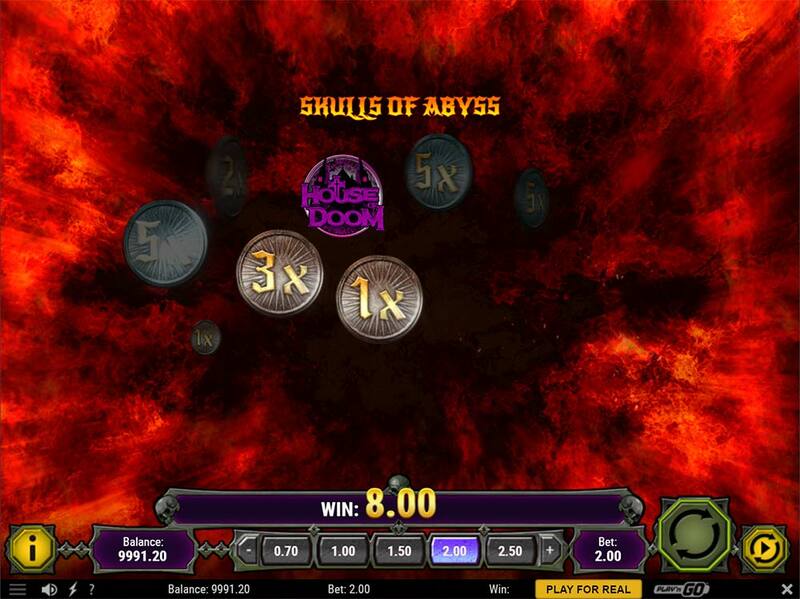 Apart from this small base game feature, there are 2 main bonus rounds to trigger the Doom Spins (Free Spins) and the Skull of Abyss (Picking Round), with the possibility of also triggering the free spins from within the picking round. To trigger these main bonus rounds you need either 3 of the special House of Doom symbols (free spins) or 3 Skull Scatters which triggers the bonus picking round. One reel is randomly selected for each base game spin, if the wild symbols lands on this reel it then expands and covers the entire reel. Triggered by landing 3 of the Skull scatter symbols on the reels which then leads to a simple picking bonus round. Reveal skulls which can reward cash prizes from 1x up to 20x total bet, with the possibility of also triggering the House of Doom free spins from this bonus game. 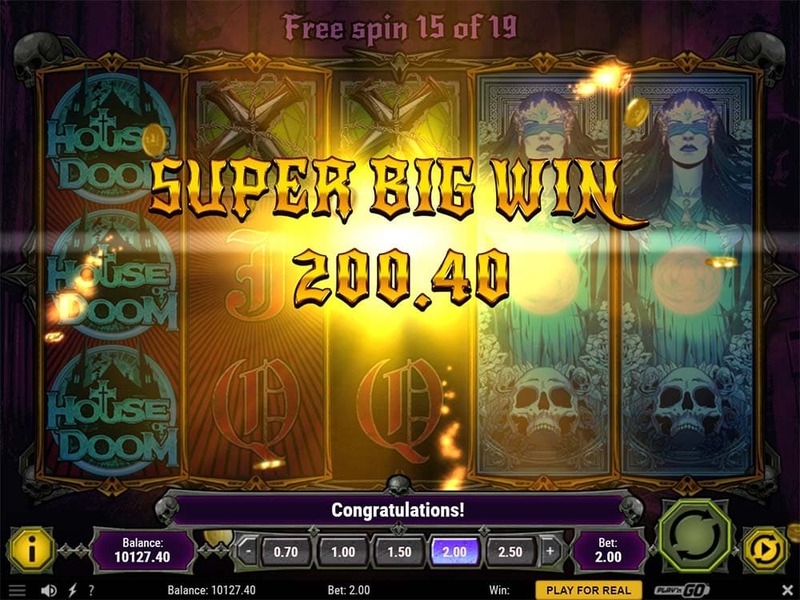 Free spins are triggered by landing 3 of the House of Doom symbols on reels. 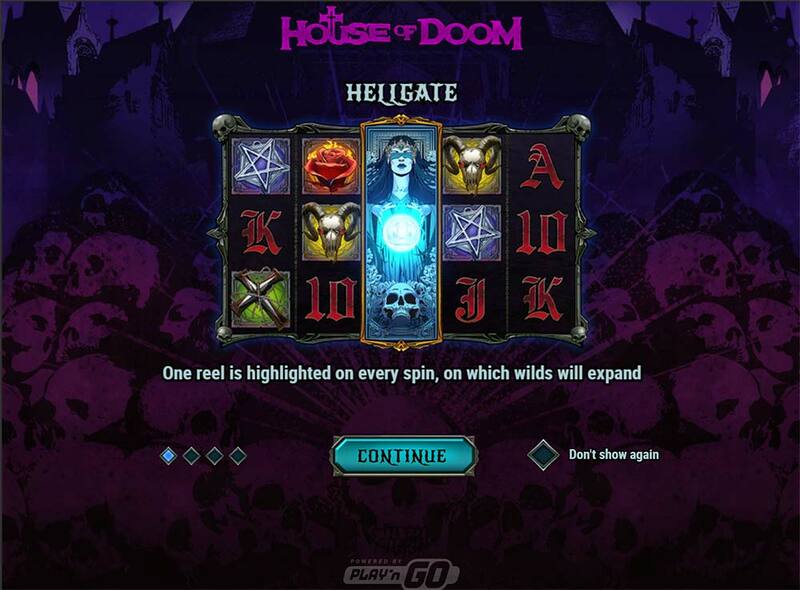 During the free spins, the House of Doom symbols act as wilds and will also expand when they land on any Hellgate highlighted reels, during the free spins there is also an increased amount of highlighted reels from 2 up to 5 highlighted reels giving the opportunity of a full screen of wilds. 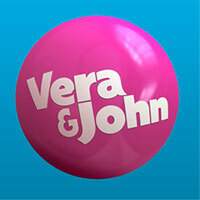 If the House of Doom symbol expands on the reels this also grants an extra 3 free spins to the bonus round. 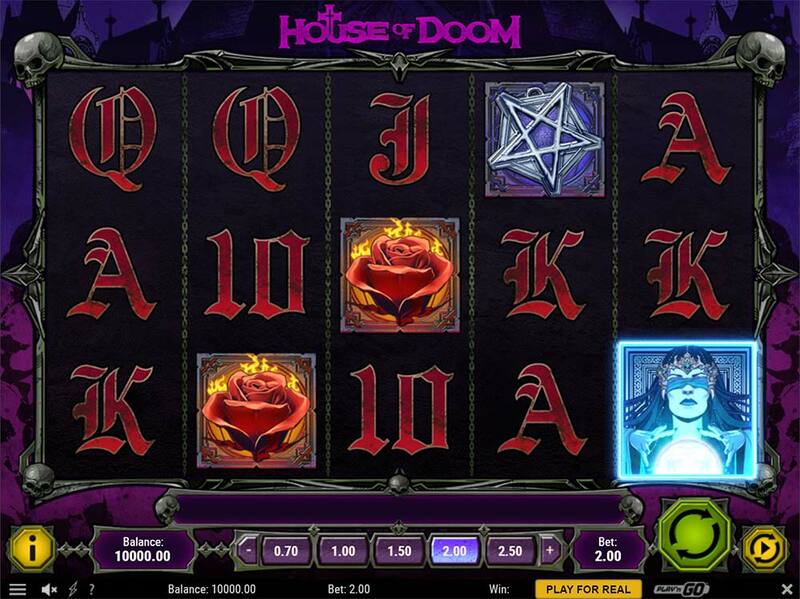 House of Doom is a decent slot release from Play’n GO, the dark and sinister theme works very well but the accompanying soundtrack does seem to be a bit too overbearing at times. Whilst the special features and bonus rounds aren’t groundbreaking and have been seen before they certainly do offer some decent win potential up to 2500x stake. 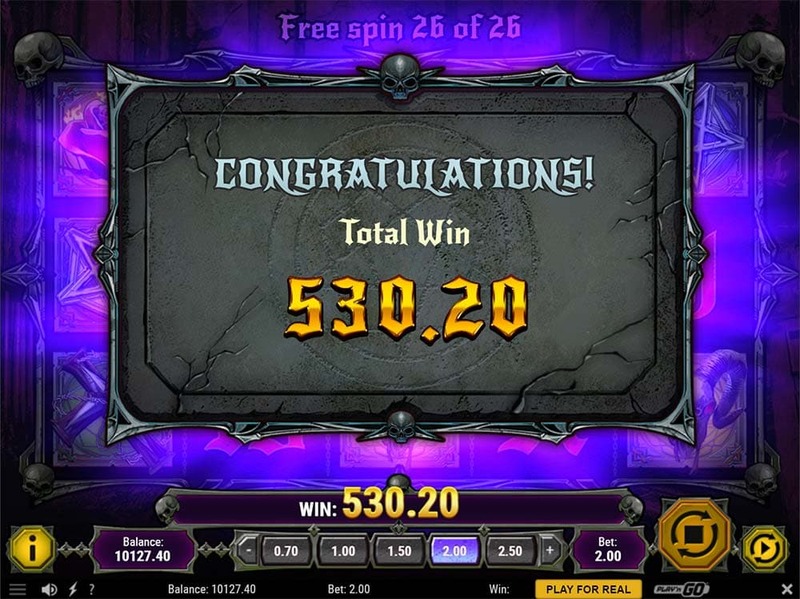 In our playtests, we managed several hits over 100x stake along with one bonus round paying over 200x stake with plenty more potential on offer with fully wild reels on offer and extra free spins being earned. 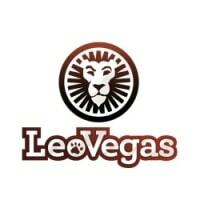 One to check out if you are a fan of 10 pay line slots with higher than average variance.